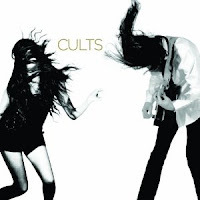 Listening to the Cults album, you can’t help but think here’s another band trying to recall 60s girl group drama, drowning their sunny melodies with reverb. Fortunately for Cults, they do it well and just about manage to avoid appearing derivative. The album starts off in great fashion, with the first three songs among the finest indie-pop of 2011. Opener 'Abducted' with its insistent rhythm and stop-start structure immediately draws in the listener but it doesn’t prepare you for 'Go Outside'. With an almost nursery-rhyme melody, it’s an infectious song and you can’t help singing along to the joyous refrain of "I really want to go out/ I really want to go outside". 'You Know What I Mean' slows matters down, with the vocal recalling the halcyon days of Motown, in particular The Supremes. Most albums would struggle to keep up the quality after this opening triptych and unfortunately this album is no different. That’s not to say the following songs are by any means poor –'Most Wanted' and 'Walk At Night' are fine songs – but it’s not until 'Never Heal Myself' that the album truly comes back to life. Opening with glockenspiel, which is peppered across the album, 'Never Heal Myself' proves to be a beautiful, echo-laden song which almost has a symphonic feel. 'Oh My God' follows, which recalls early My Bloody Valentine, shows a band willing to experiment with sounds and its prominent bass gives it a groove missing in other songs. The record seems to take another breather with 'Never Saw The Point' very much standard fare, sounding like a Camera Obscura offcut. Thankfully, the track is a minor aberration as the final two tracks round the album off in the same quality as it started. Many have pointed out how 'Bumper' rips off The Shangri-Las classic 'Give Him A Great Big Kiss' but the boy-girl vocals help give it a different dimension, while 'Rave On' is an epic closer with a huge chorus that will bring cheer to the most melancholy of souls. Cults have succeeded in creating a ‘cute’ album that will disarm its listeners with its charm. The soundtrack to the summer of 2011 is still up for grabs but Cults have made a very strong case. Click the artwork widget above to stream 'Cults' in full. The album is available to purchase at your local retailer, iTunes or Amazon.co.uk.